Some chemicals known to cause cancer, birth defects, and nervous system problems are still in use even after the US FDA and Health Canada requested (not legislated) that they be discontinued. For example, “A few chemicals found in fragrances designated as hazardous waste disposal chemicals are: methylene chloride, methyl ethyl keytone, methyl isobutyl ketone, ethanol, benzyl chloride, and toluene. Toluene not only triggers asthma attacks, it is known to produce asthma in previously healthy people.” (Citizens for a Toxic Free Marin). Fragrances are 97% synthetic chemicals, with as many as 400 chemicals in a single fragrance. By scents we mean fragrances, aromas, or perfumes that add a smell to something else. Scents can be found in personal-care products such as perfumes, aftershaves, colognes, shampoos, soaps, lotions, and deodorants. They are also found in household items, such as air fresheners, deodorizers, candles, laundry detergents, fabric softeners, and cleaning products. Fragrances are 97% synthetic chemicals, with as many as 400 chemicals in a single fragrance. That a shampoo smells like strawberries is not the issue. The issue is that the chemicals make our neurosensors believe they are detecting the smell of strawberries. Combinations from among the 6000 available chemicals create the smell of everything from new-car-smell to copies of expensive French perfumes. Causing, triggering, or worsening health conditions. Longer-term impact from bioaccumulation of fragrance chemicals in body tissue. “Unscented,” “fragrance free,” “hypoallergenic,” “natural,” “Green,” “Floral,” “outdoor fresh,” and “Environmentally Friendly” are words that have no legal definition. In other words, they mean nothing and serve only to give the consumer a false sense of security. “Fragrance Free” is usually more reliable. Volatile Organic Compounds from fragrances can add significantly to the level of indoor air pollution. That they contribute to measurable TVOC (Total Volatile Organic Compound) levels is formally recognized by ASHRAE (American Society of Heating, Refrigerating and Air-Conditioning Engineers), the US EPA, CMHC, Health Canada, and most standard-setting agencies and organizations dealing with Indoor Air Quality. Virtually every respiratory health organization lists fragrance as a trigger for asthma. 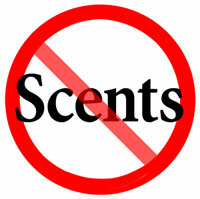 According to the US Food and Drug Administration, fragrances cause 30% of all allergic reactions. It only takes one person entering a building wearing a scented product to affect the air quality. This is because scented products can drift throughout an entire area wherever air takes them. It is not necessary to smell the fragrance to experience physiological effects. In Millqvest and Lowhagan’s placebo-controlled research, perfume was inhaled through the mouth, with the nose plugged, and asthma was reliably produced. Virtually every respiratory health organization lists fragrance as a trigger for asthma. The Sentinel Report found 13% of Nova Scotian school children were diagnosed asthmatics. For the asthmatics alone, we need scent-free programs. Symptoms that are not obvious, but are still measurable, can still be present. Not all fragrance ingredients may be harmful. In some cases it is a non-aromatic binder or surfactant that causes the reaction. However, until there is proof of no harm, the Precautionary Principle needs to be employed to protect the right of all to breathe good indoor air. All fragrance products need to be addressed under a scent-free program. Note sources of fragrance materials in your school. What approach would work in your school? Primary responsibility for health and safety rests with the administration, but a coordinated committee of staff, administration, students, and parents can improve delivery. Successful programs tend to be education-based, but with a disciplinary plan similar to the tobacco policy. Information packages for staff, students, and parents. Talks from informed presenters at appropriate forums to staff, PTA, SAC, and students. Encourage open discussion in class, at PTA, SAC, and JOHSC meetings about the health effects from scented products and the advantages of a scent free program to the learning environment. Include scent free information and websites in the student handbooks. Signs in the school, especially at entrances. Newsletters at key times: September, January, and a reminder in June to buy scent free school supplies over the summer. Regular notice of the policy in home and school communications and on the school website. Include “This is a smoke-free, scent-free school” at the top of all school newsletters. Some schools are calling their programs “Scent-Smart” instead of “Scent -Free”. Let the wider community know why your school is choosing to address the scent issue. At the time of hiring, and when appropriate, remind substitute teachers this is a scent free school. How will conflicts be resolved? Will existing policies help or hinder? What constitutes a breach of the program. Encourage a culture where scent-free is the norm. Ongoing communication is essential to this. Providing alternative product information is very important to program success. Ongoing committee follow-up: How is the program working? What needs changing or shoring up? Remember, parental support and visitor support are essential. Many products are applied at home, and many household products (such as laundry products, room deodorizers) are carried to school on clothing. Parents who come to the school for meetings and activities and will need to be scent free too.